Got a question about Whistler? Browse our frequently asked questions or contact us to find out more. Are Whistler and Whistler Blackcomb the same place? Whistler and Blackcomb are the two iconic mountains that rise above Whistler, our town. Whistler and Blackcomb Mountains together create the Whistler Blackomb ski resort in winter. In summer, both mountains are both open for sightseeing and hiking and the world-famous Whistler Bike Park is located on Whistler Mountain. Where is the closest airport to Whistler? Vancouver International Airport (YVR) handles domestic and international flights and is located a short and scenic 2.5 hour drive south of Whistler. The South Terminal of Vancouver Airport handles private aircraft. Transportation to the resort is available by shuttle bus, limousine, SUV, and helicopter (weather dependent). During the summer months, regular and charter float plane services are available. Do I need a car to visit Whistler? You definitely dont need a car to get to Whistler or get around Whistler. There are multiple options for getting from Vancouver, Vancouver Island or the nearby international airports to Whistler including shuttle bus transfers, charter vehicles and heli and floatplane services. Once in resort Whistler Village is pedestrian-only and easy to walk around. There is an Whistlers extensive local public transit system to use in resort and taxi cabs are also readily available throughout the Resort. Free shuttles are available on a seasonal bases in and around Whistler Village, along with the Upper Village, at regular intervals. 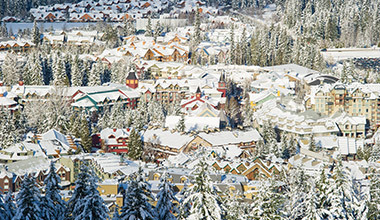 There are several neighborhoods offering accommodation that are not within walking distance of Whistler Village and the public transit system operates regularly to all of these areas with buses equipped to carry skis, snowboards and a limited number of bikes. The cost per ride is $2.50 so have your coins ready or pick up a 10-pack of tickets or a bus pass at the Whistler Visitor Centre, located near the bus loop. In summer and winter, the paved multi-use Valley Trail Network offers a car-free way to explore the entire resort on foot or by bike. Can I drive to Whistler? Yes! Whistler is approximately a 2.5 hour drive from Vancouver, British Columbia and a five hour drive from Seattle, Washington along the scenic Sea to Sky Highway (Highway 99). Like all mountain highways, the Sea to Sky Highway can experience occasional seasonal closures and intermittent delays for construction - please check the current road conditions and make sure your vehicle is properly equipped for the season when planning your drive. What documents do I require to enter Canada? Beginning June 1, 2009, US and Canadian citizens under the age of 16, or under the age of 19 if travelling with a school, religious, or other youth group, may present a birth certificate, Consular Report of Birth Abroad, Canadian Citizenship Card or a naturalization certificate. Birth certificates can be an original, photocopy, or certified copy. As of July 16, 2009, Mexican visitors require a Temporary Resident Visa to enter Canada. Please apply at the Canadian Embassy in Mexico City. Citizens of other countries, in addition to a valid passport, may require a visitor visa. Check with the nearest Canadian Consulate well in advance of travel. Other regulations apply if an extended stay, work or certain types of business activity are contemplated. Why should I book with Whistler.com? Whistler.com is Tourism Whistler's Official Centre for Resevations. 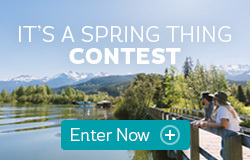 Whistler.com is locally-based and guarantees to find you the lowest prices on lodging, activities, and transportation for your stay in Whistler. 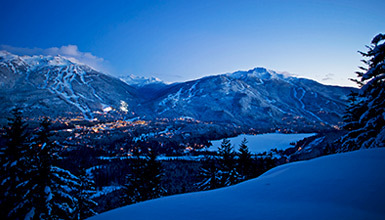 For further information on why you should book with Whistler.com, visit Why Whistler? Is booking online through whistler.com secure? We use thawte SSL Certificates to offer secure communications by encrypting all data to and from our site. The thawte Trusted Site Seal is a visible, real-time assurance that our site is protected by one of the most trusted digital certificate providers on the Web. What you do with my personal information? How do I contact Whistler.com - Whistler's Official Central Reservations? We are located directly in Whistler and can be reached by telephone at 1.800.944.7853. We look forward to hearing from you! For international numbers and alternative methods of contact, view the full contact details below. I am driving my car to Whistler – where do I park? If you do drive, there is a mix of paid and free parking available in Whistler Village at the Day Lots. Day Lots 1 – 5 offer paid parking at varying rates. For current rates, visit the Resort Municipality of Whistler website. As well, Blackcomb has free parking near Base II (Lots 6, 7 and 8) and Whistler Creekside, in the underground garage. Overnight parking is available under the Whistler Conference Centre and Whistler Public Library underground lots year-round for $5 from 5 PM to 10 AM. Overnight parking is permitted in the Day lots from May 1 to November 1 only, with exceptions for trekkers on multi-day hikes in Garibaldi Park in Lot 4 next to the berm. Sleeping/camping in vehicles is not permitted at any time. Most hotels charge a surcharge ranging from $8 to $25 per night for underground parking. During the winter, neighbourhood street parking is restricted to allow for snow clearing. Whistler enjoys a temperate climate. During the coldest winter months of January and February, the average daily high drops to -2C / 28F and the average daily low drops to -8C / 18F. The mountains receive an average annual snowfall of 11.9 metres (39.1 feet) based on a 10 year average. This consistent and reliable snowfall is complemented by extensive snowmaking technology. Summer in Whistler brings temperatures ranging from highs of 21C / 70F to 27C / 80F with August being the warmest month. You can view current conditions and see the latest weather through the webcams situated at the top of Whistler and Blackcomb Mountains, the Whistler Golf Course and Whistler Olympic Plaza on whistler.com. T-shirts and shorts are appropriate during the summer months as temperatures rise, however, if you are hiking, make sure you are prepared for sudden changes in weather - temperatures can drop quickly. If you forget something, dont worry. Whistler has plenty of shops and clothing stores where you can locate the things you need. What currency do I use in Whistler? The Canadian dollar is the currency of Canada, but the American dollar is widely accepted throughout Whistler Resort. Whistler has several banks that are open from Monday to Saturday during normal business hours as well as many ATM machines throughout the village. Conversion rates fluctuate throughout the resort, but using your credit card will give you the most current exchange rate. Are there any taxes on goods and services in British Columbia, Canada? Goods and Services purchased in British Columbia are currently subject to the 7% PST (Provincial Sales Tax) and 5% GST (Goods and Services Tax). The majority of items such as lift tickets, activities, etc. are subject to one tax (5% GST). Lodging is subject to 8% PST and 5% GST in addition to the 2% municipal and regional district tax. For more information on the Provincial Sales Tax in British Columbia please click here. Do I have to tip or provide a gratuity in Whistler? Tipping is common and expected in a number of industries in Canada and this also applies to Whistler. It is common to tip between 15 – 20% in places like bars, restaurants and pubs, taxis, private transport, ski lessons, babysitters and for other services. Where do I eat and drink in Whistler? Is there anywhere to go out at night? 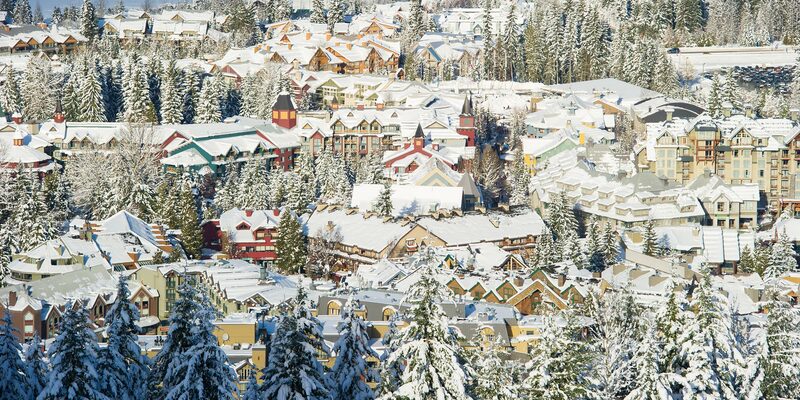 Whistler boasts an endless variety of great restaurants and international cuisines. Informal dress is the rule of Whistler; popular restaurants do get busy during peak times and reservations are recommended. Renowned for its fantastic nightlife and events, Whistler offers something to suit all ages and cultural tastes. I am camping or staying in a self-catering apartment, is there anywhere to buy food and supplies? Whistler has four grocery stores and four liquor stores which are well stocked and open daily - some also offer online shopping and delivery options. Shopping is a pastime in itself in Whistler and any gifts or necessities that you might require while visiting are available. Is there anywhere in the Village I can connect to wireless internet (WiFi)? There are WiFi connections throughout Whistler. You can connect at hotels, restaurants and even on the mountains! Depending on the supplier, you may need to purchase internet time or be a customer of the facility. How do I check for the latest snow conditions? Tourism Whistler offers current weather and snow conditions for Whistler and Blackcomb Mountains. There are also webcams situated at the top of Whistler and Blackcomb Mountains. When are Whistler and Blackcomb Mountains open for skiing, snowboarding and winter sightseeing? The ski season in Whistler typically begins around the third weekend in November, coinciding with American Thanksgiving. From there, both mountains are open daily for winter operations until late April. Whistler Mountain stays open for spring skiing and snowboarding until late May this year. Summer glacier skiing on Blackcomb Mountain is available for advanced and expert skiers and riders from early June until mid-July . What are the winter operating hours of Whistler Blackcomb? Whistler and Blackcomb Mountains are both open daily from 8:30 AM until 3 PM for the early season. As the days get longer towards the spring, the mountain eventually stays open until 4 PM. Beginning sometime in December, Whistler Mountain offers a 'Fresh Tracks Breakfast' program where for an additional fee which includes breakfast; skiers and riders may upload the Village Gondola between 7:30 and 8:30 AM. Fresh Tracks tickets may be purchased directly from Whistler.com before your arrival. How do I save money on lift tickets? Purchasing lift tickets in advance of your arrival can save you up to 30% over ticket window prices. Lift tickets must be purchased 7 days in advance of arrival and with accommodation to qualify for the discount pricing. What does 5/6 on the ticket mean and what is a 'dual mountain' pass? Lift ticket pricing will typically have numbers such as 5/6 on the pricing structure. What this means is that your ticket is valid for any 5 days of skiing and riding within any specified 6 day period. This way, you can have one day off to relax during the 6 day period. All tickets are classified as 'dual mountain' which means they are valid for skiing and riding on both Whistler Mountain and Blackcomb Mountain. All tickets, as well as sightseeing tickets, include access to the PEAK 2 PEAK Gondola. Once I have a lift ticket how do I upload onto Whistler and Blackcomb Mountains? Whistler Blackcomb is accessed by three gondolas and two chairlifts. Whistler Mountain has the Creekside Gondola, located in Whistler Creekside which is located 7 minutes south of the main village, while the Whistler Gondola and Fitzsimmons Chair are located directly in Whistler Village. Blackcomb Mountain is accessible by the Blackcomb Gondola in the Upper Village (about a five minute walk from the Village) and the Excalibur Gondola, located right next to the Whistler Gondola and Fitzsimmons Chair in Whistler Village. The PEAK 2 PEAK Gondola connects both mountains at their peaks. Lift status is updated on a regular basis. When are Whistler and Blackcomb Mountains open for hiking, biking and summer sightseeing? Usually Whistler Mountain Bike Park opens in mid-May. The Whistler Village Gondola, Blackcomb Gondola, PEAK 2 PEAK Gondola and Peak Chair are open for sightseeing through summer. Hiking trails availability depends on weather conditions and how quickly the snowline recedes. The Whistler Visitor Centre is a great resource for up to date information on whats open in the resort. What are the operating hours of the Whistler Mountain Bike Park? During the summer, the Whistler Mountain Bike Park is open from 10 AM to 8 PM with closing times dependent on daylight hours. Early and late in the season, the park often closes at 5 PM. How much time does it take to ride the PEAK 2 PEAK Gondola? Give yourself at least 1.5 hours to enjoy the PEAK 2 PEAK Gondola experience. It starts with a ride to the Roundhouse Lodge on Whistler Mountain via the Whistler Village Gondola or to the Rendezvous Lodge on Blackcomb via the new Blackcomb Gondola, which takes 20 – 25 minutes from the Village. From there you can walk into the PEAK 2 PEAK terminal and ride the magnificent PEAK 2 PEAK Gondola between both mountains, which takes 11 minutes. Your ticket includes the return trip to the Village. You can travel back and forth as much as you like on the PEAK 2 PEAK Gondola during the day, but as soon as you come down to the Village your trip will have ended. If you have a little more time, you can enjoy the PEAK 2 PEAK Gondola viewing gallery, mountain top movies, alpine hiking trails and alpine dining. I'm in Whistler for the day. What is there to see and do? On a sunny summer day, there's no better experience than the PEAK 2 PEAK Gondola. You first take the Whistler Express Gondola from the Village which takes 25 minutes. Youll arrive at the Roundhouse, a lodge where you can have lunch or a snack, and take in the spectacular view of the mountains on the opposite side of the valley. From here, hop on the PEAK 2 PEAK Gondola for a thrilling 11-minute ride over to Blackcomb Mountain. For a more exciting experience, take the silver PEAK 2 PEAK Gondola which has a glass bottom. Both mountains offer a variety of hiking trails for your enjoyment. 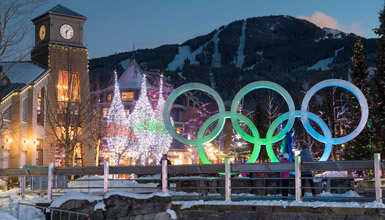 When youre back down in the Village, wander the Village Stroll with its shops, cafes and restaurants, stopping at Whistler Olympic Plaza to take a photo of the Olympic Rings. There are many options for hiking in and around Whistler. During the summer months, Whistler and Blackcomb mountains have a network of alpine hiking trails accessible by the Whistler Village Gondola and Blackcomb Gondola for all levels of ability. The paved Valley Trail also offer options for exploring the valley and accessing different neighbourhoods, lakes and beaches. Garibaldi Provincial Park offers many different trails, varying in length and difficulty. The Rainbow-Madley trail is a 16-kilometre hike through rainforest and sub-alpine meadows and takes about 6 hours return. There are easier options in the Whistler Interpretive Forest, varying from 2 kilometres to 6 kilometres, through rainforest, to Loggers Lake or around the rim of an ancient volcanic crater. Further away, Joffre Lakes Provincial Park has a 12-kilometre hike past three beautiful glacial lakes with amazing views of the hanging Matier Glacier. Take note that dogs are not permitted in any provincial parks and on the Rainbow-Madley trail. And always remember to pack out what youve taken in with you, leaving the wilderness in the same pristine state as you found it. I plan to go out on the water on one of Whistler's lakes or rivers. Are there any local safety regulations? If you are planning to enjoy Whistler's lakes and rivers this summer in a canoe, kayak, boat, raft, stand-up paddleboard or any other flotation device please ensure that you are aware of the water safety rules and regulations. Stay safe and have fun on the water this summer! Where can I camp in Whistler? There are three campgrounds near Whistler: Riverside Campground, right in Whistler; Whistler RV Park, 16 kilometers south of Whistler; and Cal-Cheak Forest Service Recreation Site, 15 kilometers south of Whistler. There are other campgrounds further away in Squamish and near Pemberton and there are walk-in, wilderness campgrounds in Garibaldi Park. Camping is not permitted in any of the day parking lots in Whistler. Be aware that campfires are not permitted in Garibaldi Park and that there may be campfire bans during the summer months at the other campgrounds in the area. Where can I see bears in Whistler? How do I know if there are bears around? What do I do if I meet a bear while hiking? Why do people wear bear bells? Bears have exceptional hearing. People hiking and biking on trails where there is bear activity wear bells that jingle as they move. The sound alerts any bears in the area that something or someone is nearby, and can help to avoid startling them in their habitat. Singing or whistling is also a method of letting the bears know that you are nearby.